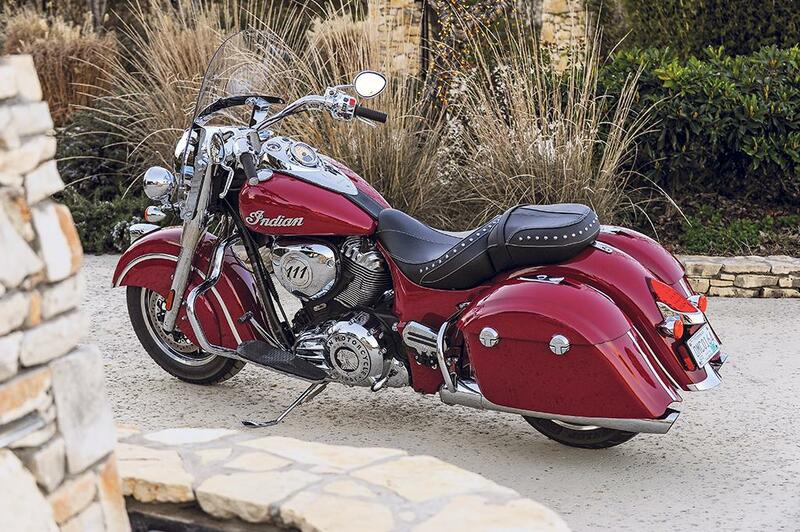 Indian’s big twin cruisers came from nowhere to rival Harley for style and ability. This latest variant has the best blend of attributes yet – albeit at a price. Named after the birthplace of Indian motorcycles in 1901, the Springfield is effectively a blend of two of Indian’s existing big twins – the Chief Vintage with its Harley Road King-style Plexiglas screen and the Chieftain with its twin hard panniers, or ‘bags’. And on the evidence so far it could well prove to be the American upstart’s best big bike yet. The tubular steel chassis is basically the same as Indian’s other big twins, too, but with slightly sharper steering geometry than the Vintage (something to do with load carrying, apparently). Though undoubtedly an imposing, large, heavy bike the Springfield’s saddle is pleasingly low and, with much of its weight carried low it’s well balanced and surprisingly manageable. 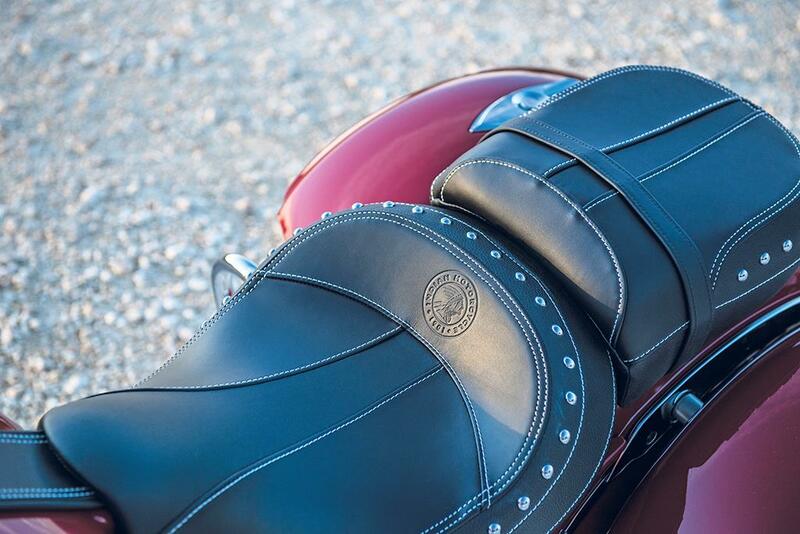 Footboards mean you can move your feet around while the new ‘Buckhorn’ bars have been canted further back to provide additional touring comfort. In short: it’s a natural, comfortable place to be. Overall, considering its size (whether true or not Indians definitely feel slightly larger and more substantial than their Harley equivalents), the Springfield’s handling composure is impressive. Simply: the engine and chassis ‘just do it’, without disappointing in any way. Like all of reborn Indian’s ‘big twin’ cruisers, the Springfield is based around the impressive and all-new-in-2013, aircooled, 1811cc ‘Thunderstroke’ V-twin. With its massive peak torque available at just 2600rpm, you easily pull away from barely more than idle. Wind it on and stomp through the six gears (a heel-toe ‘change is available as an option) and it putt-putt-putts effortlessly up to 70+ with barely 4500rpm showing. Eighty-plus is just a twist of the wrist away with more to come if required. And if you still want more, a performance kit comprising hotter cams, free-er breathing air filter and louder cans is available which is claimed to boost performance by 10%. For 2019, Indian updated the Springfield (alongside other models) to incorperate three riding modes, which can be adjusted on the fly. These consist of Tour, Standard and Sport. 'Tour' mode features a smooth throttle response for relaxed riding, meanwhile the 'Standard' setting offers slightly more poke for quick passing ability, yet remains dosile and predictable at low-speed. 'Sport' mode gives the most imidiate throttle response for a more aggressive power delivery. Alongside modes, the bike now also features rear cylinder deactivation, to help keep the rider comfortable at a standstill. Essentially, the bike will drop a cylinder automatically when stationary once up to opperating temperature, with an ambient temperature above 15-degrees. This will then generate less heat in stop-start traffic. The rear cylinder instantly reactivates when throttle is applied. Quality-wise the Springfield’s a mouth-wateringly gorgeous piece of kit. It’s literally awash with chrome (Indian claim it’s slathered with more than any rival) and generously appointed with stylish art deco touches: those definitively Indian flared mudguards or fenders, for example; or the illuminated Indian ‘headress’ mascot atop the front guard; or the tactile, studded leader saddle even. And while a little early to proclaim on reliability, Indian’s impressive (and industry-leading) five-year warranty should way-lay most fears. The Springfield has a hefty price tag, whichever way you look at it – being a couple of grand more than its most basic Harley rivals. But then it’s impressively well-equipped and beautifully finished, too all of which goes a long way to justify it. If you want the most lavish, most glorious, best performing American bagger, this is currently it. 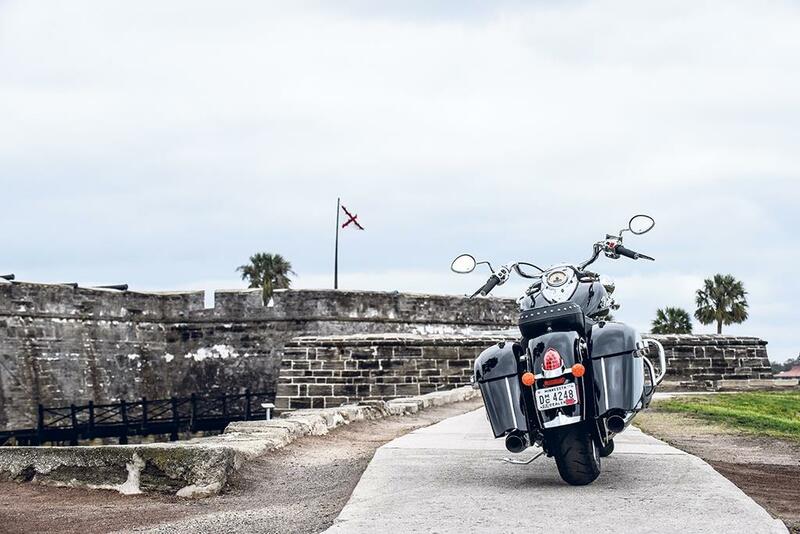 As the Springfield is intended very much as a premium, touring machine it’s specced up with cruise control, adjustable pillion footboards, ABS, tyre pressure monitors and even central locking for the saddlebags. You also get genuine leather seats and a quick-release screen. Otherwise it’s fairly familiar Indian fare with a single big dial with the digital LCD tacho incorporated. Nothing much to write home about or be surprised by, but lacking nothing of note, either. The stripped-back Dark Horse edition also features smatterings of tech, including ABS, cruise control, keyless ignition and tyre pressure monitoring. 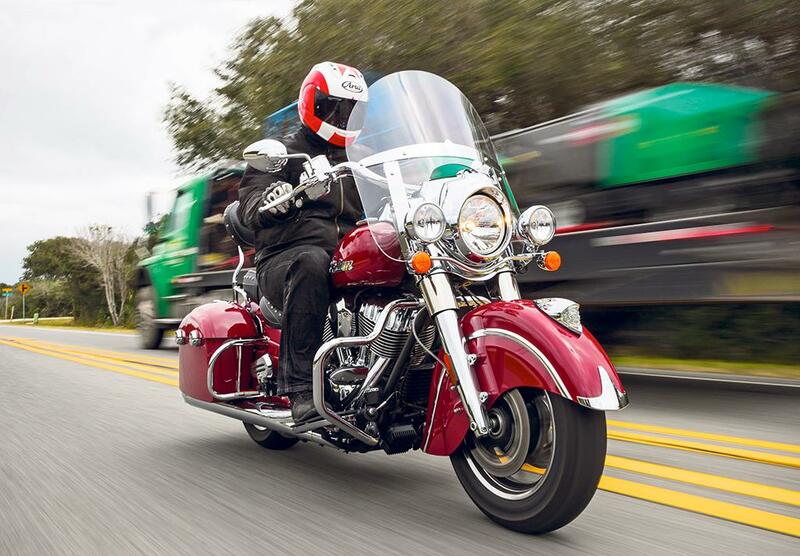 2016: Indian Springfield launched, basically a big twin cruiser mix of Indian’s Chief Vintage and Chieftain in having Harley Road King style Plexiglass screen with hard panniers. Indian Springfield Dark Horse is a similar model, featuring a more stripped-back look, but enjoying a similarly well-specced overall package. 2 owners have reviewed their INDIAN SPRINGFIELD (2016-on) and rated it in a number of areas. Read what they have to say and what they like and dislike about the bike below. It has a cast aluminium frame and not tubular steel as the MCN review says. Front brake is a little "wooden" feeling.